It’s a hot and humid summer day in Southeastern, PA. Whether you live in Collegeville, King of Prussia, Philadelphia, Royersford, or West Chester, the summer sun is beating down while your family and friends occupy the front and back porches of your home for that annual Fourth of July cookout. If only there was some relief today though, the hottest day on record, with no wind in sight! Thankfully, there is an option: outdoor ceiling fans. 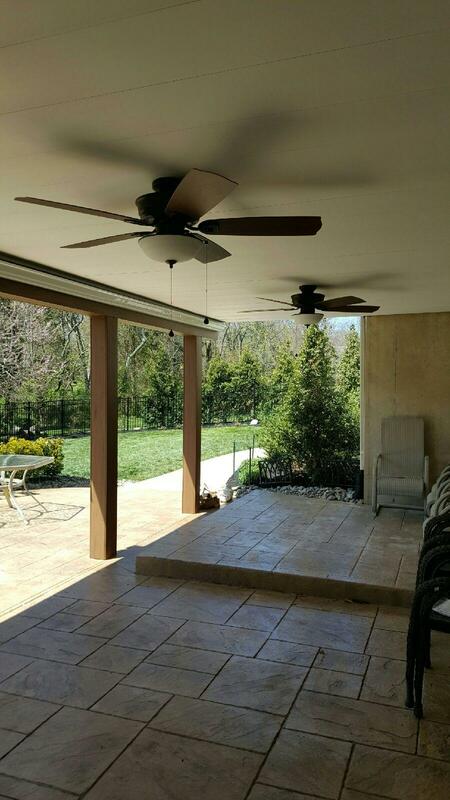 Installing outdoor ceiling fans on your front or back porch areas creates comfort and relief so you can enjoy the outdoors without being suffocated by that sticky, humid air. Outdoor ceiling fans generate air circulation that can make it feel like it’s 8 degrees cooler! Not only the comfort, but there are a variety of fan designs out there that can match your home’s decor to make your porch or deck areas aesthetically appealing. YOU CANNOT USE AN INDOOR CEILING FAN OUTSIDE! I REPEAT: YOU CANNOT USE AN INDOOR CEILING FAN OUTSIDE! Indoor ceiling fans cannot withstand outdoor weather conditions like the obvious rain or snow, as well as the constant beating down of the sun’s rays. Outdoor ceiling fans are made with special material for outside weather conditions like wet or damp areas, so that there are no fire-related electrical hazards; however, there are two different types of outdoor fans to choose from depending on the environment of the area in which they will be installed. Wet rated outdoor ceiling fans are for areas in which the fan can come into direct contact with water. For example, partially covered porches or decks without a full enclosure can experience wet conditions from things like rain, snow, ocean mists, etc. The blowing of the wind with the addition of any moisture in the air will make the ceiling fan susceptible to water, which is why a wet rated outdoor ceiling fan is necessary. This type of ceiling fan is made with a moisture-resistant material to keep the inside electrical components safe, and the outside body safe from weathering. Damp rated outdoor ceiling fans are only to be considered if the outside porch or deck area is completely enclosed. DAMP RATED OUTDOOR CEILING FANS CANNOT COME INTO DIRECT CONTACT WITH WATER! Please make sure you are aware of this when choosing this type of fan for your location. Damp rated ceiling fans are designed for garages, sunrooms, screened-in porches and decks, etc. where no water is capable of getting in. There are so many designs out there for both wet rated and damp rated outdoor ceiling fans. The possibilities of turning your porch or deck area from drab to chic are endless! When you have decided that outdoor ceiling fans could be for you, and you have picked out which type (wet rated or damp rated) is right for you, give KB Electric LLC a call! Remember: Electrical work is not for an amateur. A licensed electrician should be the only one to install outdoor ceiling fans due to the amount of experience, and safety knowledge.